Klarrio recognized by CIO Applications as "Top 10 Data Analytics Services Company"
CIO Applications Europe recognizes Klarrio as a 2018 Top 10 Data Analytics Services Company in its December Data Analytics special. Klarrio is system integrator specialized in leveraging cloud native and open source technology to implement scalable data and analytics solutions for its customers. Headquartered in Belgium, Klarrio also has offices in Australia, The Netherlands, Germany and USA which enables it to provide 24/7 follow-the-sun support for the solutions it provides. “We are glad to announce Klarrio as one among the Top 10 Data Analytics Consulting/Services Companies – 2018. Klarrio is a leader in all professional & Integration services related to IoT & Analytics. We are pleased to recognize Klarrio for its exemplary contribution to IoT Business Strategies, Integration Services, Technology & Design, Custom Builds, Analytics, and Security & Privacy,” said Joe Phillip, Managing Editor of CIO Applications Europe. 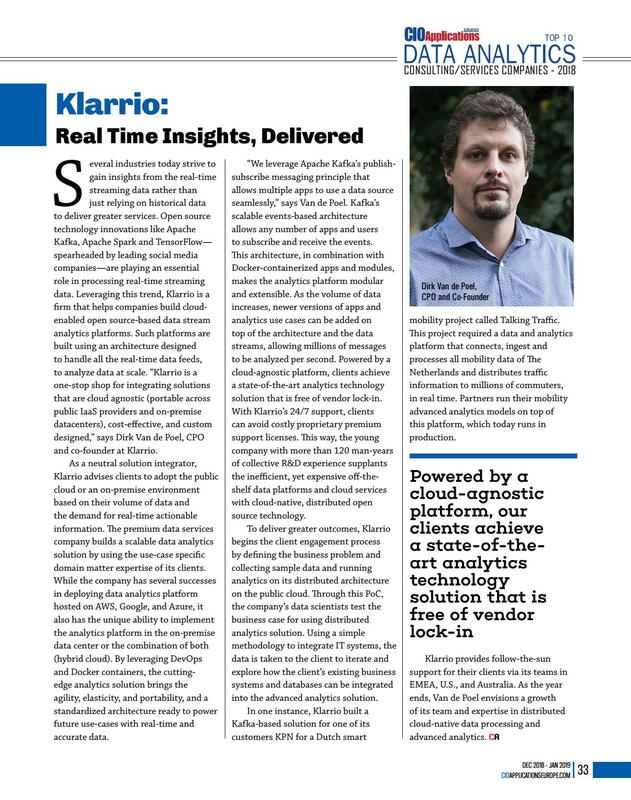 In the CIO Applications Europe magazine Dirk Van de Poel, Klarrio CPO, explains how cloud agnostic platforms enable clients to achieve a state of the art and future-proof data analytics solution that is free of vendor lock-in. Discover the magazine online or read the full article here. Klarrio is now partner of the Agoria Solar Team!